It’s one of the ironies of life that shopping for a comfortable recliner is so stressful. Theoretically, it should be a calm, Zen-like experience wherein you spend time nestling into chairs that hug you, transporting you to an oasis of relaxation. The harsh reality, however, is more like struggling to escape overstuffed monstrosities that threaten to swallow you whole! Here at Rosner, we believe you should begin your recliner shopping experience with the tools for success. We’ve put together a guide to help you determine what features will suit your desires so there’s no need to waste precious relaxation time trying out chairs that don’t suit you. So read, relax, and enjoy! When selecting a recliner, size definitely matters. A chair that comfortably seats a 6’2” gentleman is not ideal for a petite, 5’2” lady. Fortunately, most of our chairs come in two sizes, so each person’s needs can be easily accommodated. If only one chair is being purchased, it should meet the needs of the primary user. Take into account such features as adjustable head and neck support and footrest position – an over-or-under reach at either end may indicate the need for a different size chair. Sturdy construction of the chair is of primary consideration. Look for a strong, stable base, as in our Relaxer series, which provides a firm MDF foundation, or the stylishly contemporary Space collection, with its secure, five-point metal base. Solid hardwood and metal in the chair frame will provide years of durability. Next, look for body correct support. Ergonomically correct positioning is essential for the chair’s padding, and we believe that is best achieved with cold-cure molded foam. This space age material is featured in the IMG of Norway series of chairs available through Rosner Home. 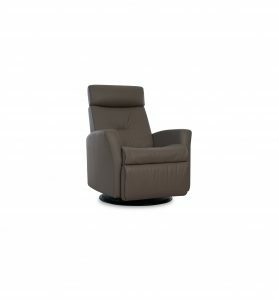 The steel frame and springs are encased in cold-cure molded foam, thus ensuring correct back and lumbar support, as well as comfort throughout all areas of the chair. Long gone are the days when style was sacrificed for comfort. Today’s recliners run the gamut from traditional to contemporary styling, and colours that range from chili to chocolate, pebble to tuxedo. Many are available with wood or chrome accents, to harmonize with existing furnishings or complement a suite of new purchases. Motor – assisted lift functions raise and lower the seat and back, and allow selective lift, recline, and return to start positioning. Some have an optional battery back-up system. Handheld controls with oversize buttons make operation effortless. Considering these factors before venturing into a showroom will save you hours of aggravation, and will help the sales associates provide better service by understanding your needs. After that it’s simply a matter of waiting (patiently) for delivery of your new recliner chair!